I canned a big batch of Asian Plum Sauce this fall. Ever since I have been looking for new ways in which to utilize this delicious sauce. 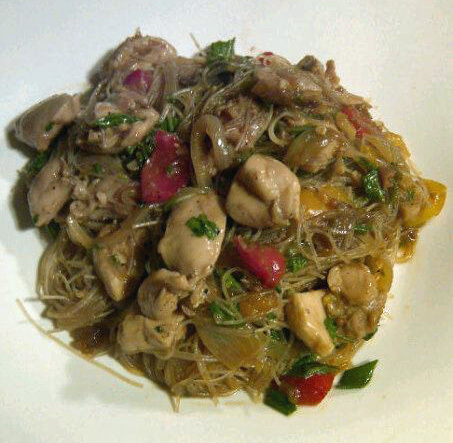 Chicken & Rice Noodle Stir Fry with Asian Plum Sauce is a terrific quick and easy dish which makes the Asian Plum Sauce the star. I love that this recipe is naturally dairy and gluten free! Feel free to use more vegetables in your stir fry. I think that shredded carrots, broccoli florets, and snow peas would all be wonder additions. However, because we have been snowed with the roads closed for the better part of this week I had to make due with what I had on hand. Soak the rice noodles in hot water per the package directions. Meanwhile, heat the oil in a large skillet or wok over high heat. Add the onions and cook stirring occasionally until browned. Add the bell peppers and continue to cook for 5 minutes. Add the garlic, ginger,chicken and optional vegetables. Cook stirring occasionally until the chicken is browned and cooked through. Combine the Asian plum sauce, soy sauce, water and sesame oil in a small bowl. Add the rice noodles, sauce, scallions and cilantro to the pan. Stir well to coat everything evenly with the sauce. Reduce heat and continue to cook, stirring continuously until most of the sauce is absorbed - about 3 minutes. Soooo good Steph...thanks for the recipe!